HOUSTON (KTRK) -- Louisville dropped eight spots to No. 11 after getting trounced by Houston, which jumped in at No. 18. The Big Ten placed three teams in the top five of The Associated Press college football poll for the first time in 56 years, setting up a No. 2 vs. No. 3 matchup for Ohio State and Michigan. Clemson is No. 4, and No. 5 Wisconsin gives the Big Ten three of the first five for the first time since Nov. 7, 1960, when Minnesota was No. 1, Ohio State was No. 3 and Iowa was No. 5. The 113th meeting of Michigan and Ohio State will mark the 11th time the rivals will both be ranked in the top five and the first since 2006, when they had their only 1-2 matchup. The Buckeyes won that game 42-39 in Columbus to earn a spot in the BCS title game. - Alabama's Nick Saban won his 41st game while coaching a No. 1 team, passing Ohio State's Woody Hayes and Florida State's Bobby Bowden for the most victories with a top-ranked squad. Houston began the season ranked No. 15 and made its way to No. 6 as it started 5-0. Losses to Navy and SMU knocked the Cougars from the rankings, but they surged back in after beating the Cardinals 36-10 at home. 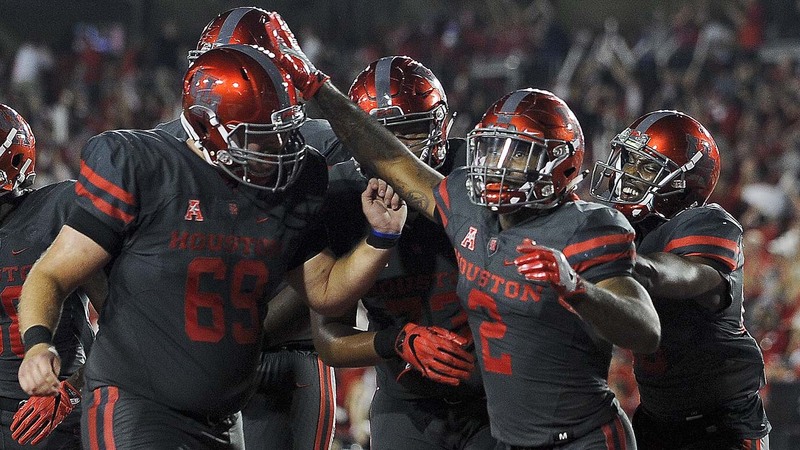 Those conference losses will keep Houston out of the American Athletic Conference championship game, but the Cougars are the AAC's only ranked team this week. - Tennessee moved back in at No. 24. - Troy's first appearance in the rankings last a week. The Trojans dropped out after losing to Arkansas State. - San Diego State again spent just one week in rankings. Since 1977, the Aztecs are 0-4 as a ranked team. - No. 13 Florida moved up eight spots after narrowly slipping past LSU with a late goal-line stand. - No. 9 Colorado, No. 10 Oklahoma State and No. 12 USC all moved up three spots. - No. 19 West Virginia fell nine spots after losing to Oklahoma. - No. 21 Utah dropped 10 spots after a last-second loss to Oregon. No. 16 Auburn at No. 1 Alabama. The Crimson Tide have already clinched the SEC West and could likely lose and still make the playoff. No. 3 Michigan at No. 3 Ohio State. Jim Harbaugh vs. Urban Meyer II. No. 6 Washington at No. 23 Washington State, Friday. The Apple Cup will decide the Pac-12 North. No. 21 Utah at No. 9 Colorado. The Buffs win the Pac-12 South with a victory. A loss gives the division to USC. No. 13 Florida at No. 15 Florida State. The Gators and Seminoles both still have hopes to score a major bowl bid. No. 22 Texas A&M at No. 25 LSU. Beating the Aggies helped Les Miles save his job - temporarily as it turned out - last year. Can another LSU victory against A&M help Ed Orgeron keep coaching the Tigers?